The work put forth by the hardworking individuals and organizations in "Dodo Heroes" extends far beyond what you see in the series. They all go above and beyond to help the animals in their care, from rescuing koalas in Australia and saving suffering animals in Afghanistan, to freeing circus animals from their chains. For more information on how to get involved, we invite you to visit their respective websites and follow them on social media. You can also keep up on the series by following Animal Planet on Facebook, Instagram and Twitter. And if you choose, you can contribute to a special fund set up to distribute money between the charitable organizations leading the effort to help better the lives of their animals. If you're in the United States, you can donate by texting Dodo Heroes to 707070. Every donation will be split evenly between nonprofits in the Dodo Heroes Fund. In this episode you meet Jabu a sweet elephant with a severe wrist injury as a result of a tragic encounter with a wild bull elephant. 31-year-old Jabu endures aches and pains beyond his years. He should be in the prime of his life and reaching the very upper echelons of male elephant society but instead he suffers from a debilitating and life threating injury. When one has 6 tons of weight bearing down on an injured wrist joint, it takes giant sized medical care to keep going. Jabu now needs further extensive treatments to keep him walking. Doug and Sandi Groves, his life long guardians, are doing all they can for Jabu, but urgently require donations to pay for his next steps including purchasing diagnostic equipment (x-ray machine and ultrasound large enough for Jabu), orthotic shoes, preventative medications and stem cell therapy. They are working with academic and vet partners to help make these therapies possible. His monthly medical costs alone are $6000. Your support will help keep Jabu walking! UPDATE: Since Jabu's original injury to his front right leg 18 months ago we have seen a steady deterioration in his left leg, which has had to provide additional support. The strain has meant that this leg, too, is compromised. X-ray results show he now has angular limb deformity in both legs. Jabu is less steady on his feet and experiences reduced mobility. They are considering surgery for Jabu in an attempt rectify the progressive angulation and save his life. Visit the Living With Elephants Foundation website to support Jabu and learn more. Follow Jabu on Facebook and Twitter. Jabu's updates can also be found on Instagram or his blog! 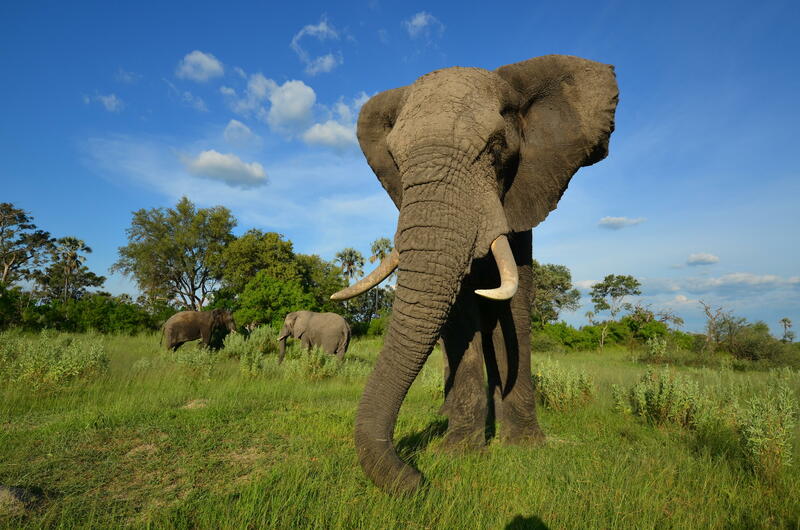 Living With Elephants Foundation cares for rescued African Elephants in the sanctuary of the Okavango Delta, Botswana. Presently, the focus is on medical care and treatments for Jabu due to his recent injury. Derrick Campana spent years making prosthetics for people before bringing his talents to animals and launching Animal Ortho Care, "the only animal bracing and supports company in the country to offer custom, semi-custom and customizable animal braces." With more than 10 years experience under their belt, Campana and his company have built prosthetics and braces for all sorts of animals, from dogs and cats, to elephants, camels, and even a cow. One elephant fortunate to receive Campana's care is Jabu, a 6-ton African elephant who needed a leg brace after suffering a fall. In what could be the most challenging case of his career, Campana traveled across the world to Botswana to give the gentle giant his brace and help Jabu in the first step in achieving a better quality of life. To learn more about Animal Ortho Care, visit the company's official website and follow them on Facebook and on Twitter at @AnimalOrthocare. You can also learn about Campana's other company, Bionic Pets, which focuses on animal prosthetics. Helping koalas is a family affair for the Bees. With her husband Tim and 10-year-old daughter Izzy by her side, Ali Bee goes above and beyond to help Australia's dwindling koala population. Between Ali's work as a veterinarian at Magnetic Island Koala Hospital and Izzy nursing koalas to health from the family home, the Bee family's commitment to this beloved species knows no bounds. Visit the Magnetic Island Koala Hospital Facebook page to learn more. Founded by British Marine, Pen Farthing, Nowzad seeks "to relieve the suffering of animals in Afghanistan" as Afghanistan's first and only official animal sanctuary. Inspired by Farthing's military deployment and the dog who would become the organization's namesake, Nowzad has reunited 1,200 dogs and cats with the soldiers who rescued them while deployed. Visit the organization's official website to learn more about Nowzad, and check them out on Facebook and on Twitter at @Nowzad. Founded by Jan Creamer and Tim Phillips, Animal Defenders International (ADI) has offices in Los Angeles, London, and Bogota (Colombia), and works globally to end the suffering of animals and protect wild animals. ADI undertakes long term undercover investigations inside cruel industries to gather evidence in order to create awareness and secure public support for legislation to end the suffering of animals. As a result of ADI's campaigning, national restrictions on performing animals in traveling circuses have been enacted in over 40 countries. ADI currently has a bill to ban the use of wild animals in circuses before the US Congress (The Traveling Exotic Animal & Public Safety Protection Act) and recently secured a UK government promise to end such acts by 2020. ADI assists governments enforcing these bans on circus animal acts. In Bolivia and Peru ADI tracked down and raided every circus and rescued every animal saving approaching 200 animals. Jan & Tim's Greatest Show on Earth features part of the huge mission in Peru. ADI's team is currently helping the Guatemalan authorities enforce their circus ban and has already begun rescuing lions and tigers from circuses. ADI is in the process of opening its own Wildlife Sanctuary in South Africa specifically to give circus animals, like lions, back the life that has been denied them. ADI is also caring for monkeys, like Pepe, and bears in ADI Peruvian forest sanctuaries. To learn more about ADI, visit the organization's official website and follow ADI on Facebook and on Twitter at @AnimalDefenders. Some call Ponso "the loneliest chimp in the world," but what they don't know is that he has a group of heroes in his corner from SOS PONSO, an initiative created by Alexandra Gazel, dedicated to his care in Cote d'Ivoire. Of those heroes, Ponso shares an unbreakable bond with Estelle Raballand, an SOS PONSO consultant whose goal is to establish a chimpanzee sanctuary through Akatia, an organization dedicated to improving chimp welfare and conservation in Cote d'Ivoire. Estelle hopes to introduced Ponso to other chimps once the sanctuary opens up. Go online to learn more about SOS PONSO, and follow the project on Facebook. Visit the Akatia website for more on the organization and you can also visit their Facebook page. Established in honor of a baby elephant named Boon Lott, Boon Lott's Elephant Sanctuary (BLES) is a 600-acre refuge for elephants rescued from Thailand's tourism and logging industries. Founded by Katherine Connor in 2007, BLES also allows individuals to stay at the sanctuary overnight (with a reservation of course - no walk-ins, please) and help care for the elephants while they're there. To learn more about BLES, please visit the sanctuary's official website and follow BLES on Facebook and on Twitter at @BLESELE. You can also get a close look at the sanctuary's elephants by visiting Instagram at @blesele.